Why Do I Feel Irritated for No Reason? Are you finding that you are losing your temper in situations that you never used to? And have become more impatient than you once were? 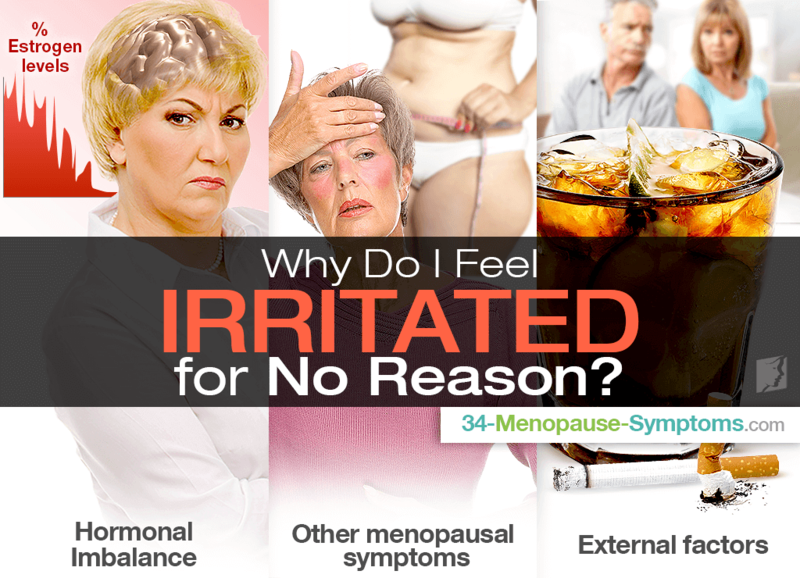 Feeling angry and irritated more frequently is possibly one of the less obvious symptoms of menopause because it is not physically apparent; and yet it affects most women through this time in their life. Understanding the reasons for this change in mood, and knowledge of how to avoid irritability, is helpful for managing this sometimes difficult aspect of menopause. Read on to find out more about irritability causes. It is important to realize that the change in hormone balance during menopause, can have a significant impact on the brain. Studies suggest that estrogen levels have a direct correlation with the levels of the neurotransmitter, serotonin; when estrogen decreases, as does serotonin. More investigation is required in order to fully understand the mechanisms of how these chemicals work together, but it is widely acknowledged that serotonin has an influence on our mood and behavior - lower levels of it can cause anxiety, irritability, and a general negative outlook. Hot flashes. This unpredictable annoyance can happen at any time, and can quickly make you feel hot and bothered. This may lead to impatience and a short temper. Weight gain. Up to 90% of women find that they gain weight during menopause; a factor that can lead to a bad mood due to frustration and feeling self-conscious. Memory lapses. Change in hormone balance during menopause can sometimes cause minor memory loss in some women. This can be infuriating at times, especially when concerning seemingly simple things such as dates and names. Insomnia. A lack of sleep is known to be detrimental to mood, often causing irritability and impatience in many people who suffer from it. Personal habits such as alcohol intake and smoking can also intensify feelings of irritation, as they are generally detrimental to health. Be aware that most women experience a change in their disposition at sporadic times throughout the stages of menopause. Realizing that you are not alone can be extremely helpful in managing irritability, as can learning how to improve your spirits and avoid it. For further information about irritability causes, click on top 5 exercises for irritability relief. When hard days start to add up to weeks, extreme irritability can begin to affect normal activities. Learn more here.